Get a good nights sleep and wake-up more refreshed than ever, no matter where you are with the HoMedics Portable Mini SoundSpa. We have the full-sized version for home and purchased this one for daycare and when we are out. Light, portable and does the job! Purchased for camping with the baby, it's perfect. 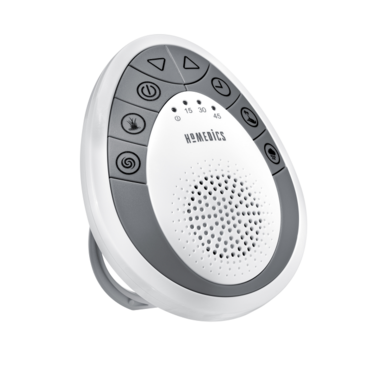 I previously bought the full model of the Homedics sound spa, and it was not necessary. The baby only needs one noise anyways. Only thing is the volume levels are very spread out (eg. really quiet, medium, really loud). One of my best purchases for our new baby! I initially thought I was getting it for him, but I soon realized that it helps me sleep better, because I'm not laying there listening for every little noise! Nice and compact. The ocean noise is my favourite! This is so handy to block out traffic noise, construction etc. I wish it came with an adaptor so it could be plugged in, the choice of sounds is all you really need. I would recommend it especially for travel.